Prior to the Rockingham weekend and it would have been hard to bet against the vast experience of Neal to pay off and bring him a fourth BTCC title. Up until that weekend, Neal had scored ten podiums and led the standings by a slim margin from eventual winner Jordan. High points included impressive wins at Brands Hatch, Thruxton and Croft as well as Neal’s landmark 500th BTCC race at Donington Park back in April. Despite not scoring any wins that weekend, Neal was still happy with his performance and said, “It has been a special day for me. Of course you always want race wins but I’ve been around long enough to know that you can’t have it all your own way all the time.” This attitude was to see him stay at the sharp end right through to Rockingham, where Neal’s championship chances took a downward turn. Things began steadily at the Northamptonshire circuit, as the 46-year-old qualified seventh with maximum championship success ballast on board. 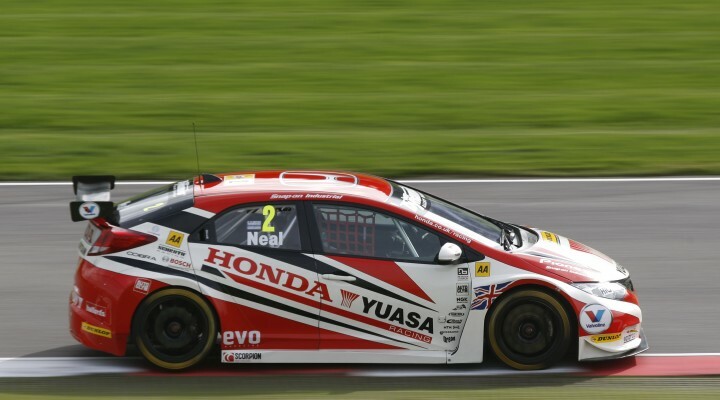 In race one, however, an uncharacteristic mistake would see Neal’s Honda spin behind the safety car in slippery conditions, plummeting him down the order to finish a lowly 14th place. Things were to go from bad to worse in the second contest, as on lap nine there was a suspension failure on his Civic that sent him off the track and out of the race. A superb effort in race three saw Neal drive through from the back of the field to score good points in seventh, but with main rival Jordan winning two races on the day, the damage had been done. The triple-champion then made things even harder for himself, breaking a finger during a martial arts training session between Rockingham and Silverstone. It was the third year in succession that Neal sustained a hand injury in the closing stages of the season, and while it didn’t rule him out of the last six races, it certainly threw a curve ball his way.